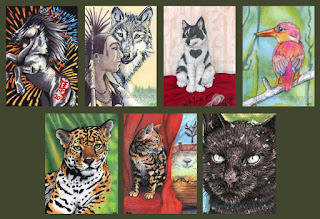 Once again I made a LOT of ACEOs in 2014, 71 of them by my count – wow! So to present them this time, I have tried to group them in a semi-logical order. Yes, this post is going to be quite full so I will try and not swamp you too much! I got a bit more experimental this year particularly since I had been gifted some very neat acrylics including iridescent paints and my favourite a little tub of phosphorescent acrylic. *squee* Phosphorescent for those that are not familiar with the term is glow-in-the-dark, UV (black light) reactive paint. I am a sucker when it comes to anything that sparkles or glows. I was also interested to discover what effects could be created using this medium since in natural light it is almost clear and I liked the idea of having aspects hidden in the art that could only be viewed in total darkness. I don’t feel I achieved the hidden aspect part well but I did have fun and was pleased with the below four pieces that I made. Each is shown with a photograph taken next to my UV/Black light lamp, because yes I already had one just hanging around even before I got the phosphorescent paint! The top two here were created on paper while the bottom two were painted on ACEO sized woodblocks. 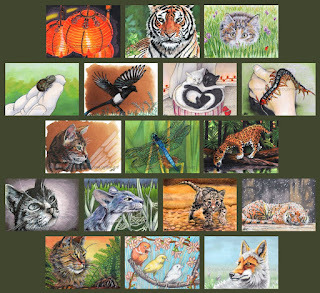 The top left is the outlier of the group and thereby by default more interesting because I worked on a Bristol vellum card using watercolour markers, pen and coloured pencils as the base before applying the paint. 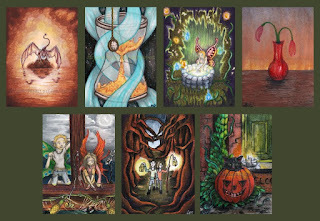 Top right was all acrylic on a Strathmore illustration board, it’s titled ‘the Ibegon,’ with reference to the green tendrils; this is a fictional, carnivorous plant I created for my narrative so while the visual subject of the art card is the skull the underlying idea was about the plant. And I do love my puns, the name, ‘ibegon,’ is meant to be pronounced ‘eebegone’ as in ‘he be gone,’ which is what happens if you step on one of these, maybe then they should have been ‘you be gone’ -Oh I can hear the *groans* already lol. Back to the art, the bottom two woodblocks in this set were slightly different. The skull was painted onto pure wood and the moon had a canvas surface laid over the wood. Interesting to see how the acrylics worked on each of these. Onwards then and another experiment I tried this year was collage. 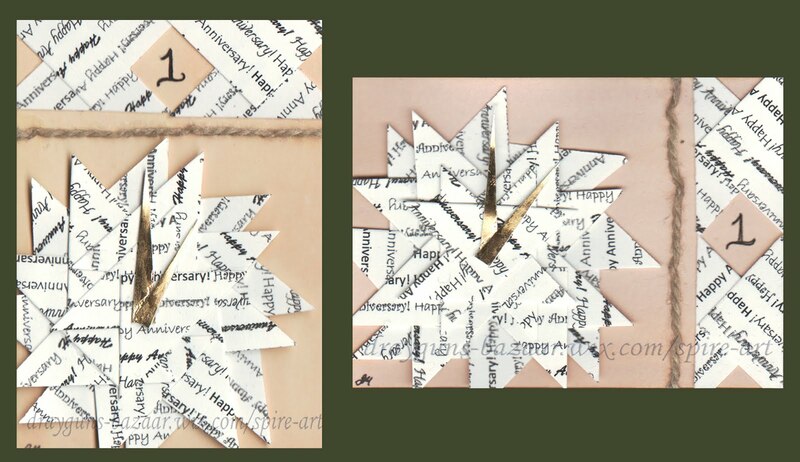 I was working toward the theme of first anniversary and as soon as I realised that the first wedding anniversary is represented by paper, clocks and string I had my goal. I’m not certain about how successful the two pieces I made for this theme were but it was an interesting thing to try. Also discovered that I make twice the mess with glue than I do with paint and ink xD Oh well. So, yup, I do cute and creepy and love both realism and fantasy. I’ll start with the realism ones. I will say that Hyper-realism is great to witness but I don’t think it’s something I would want to achieve (not sure I even could!). I prefer to work in a way that allows the viewer to know it is art and not a photograph or reproduction. Hyper-realism artists have an awesome talent but I like a little splatter in my own work and the art I buy. 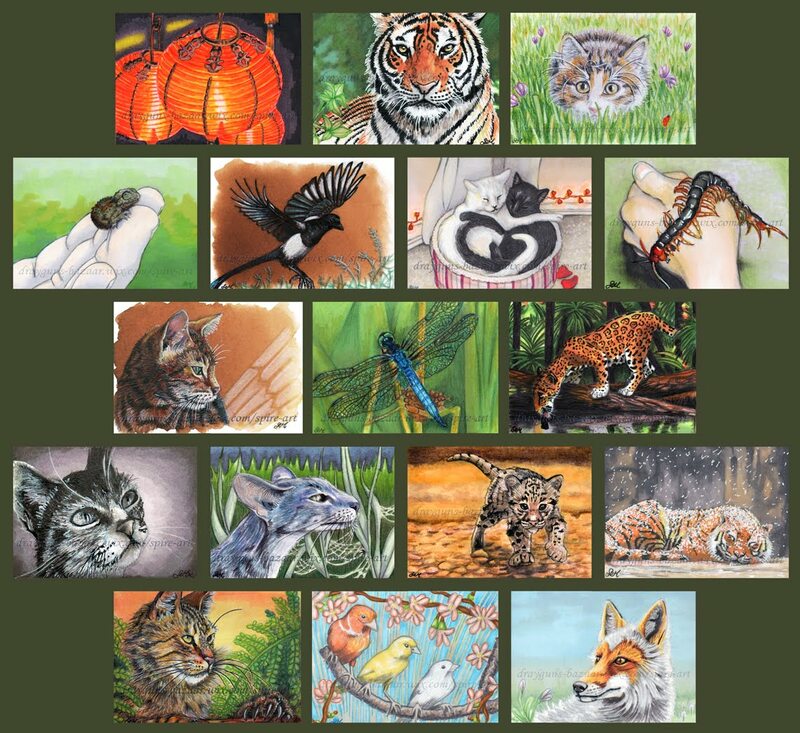 I use photo references for all my ‘realism’ pieces and consider them as good practice to learn more about the subjects I enjoy painting and illustrating. Fantasy pieces are always fun; I never quite know where they will go. The freedom! Ah and argh, freedom to use all I have learnt from realism and twist it any way I choose is great but then it’s also frustrating. Sometimes too many options work against me! Still I feel more alive when creating fantasy pieces even if they don’t always turn out quite as shiny as the realism ones. Ah yes, you knew it was coming; something that involves my narrative yet again. You know the one, that one I have still not finished writing after eight years or so lol. Well book in me or not I have had fun drawing the characters from it especially during those times when redrafting and writing got far too tiresome. 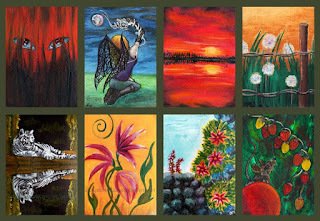 It is a bonus for me to be able to switch to art when my writing brain falls over. 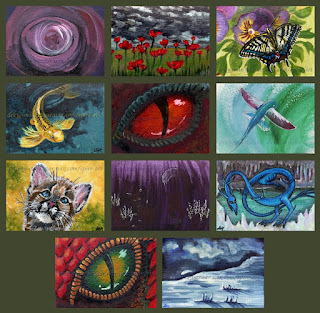 Below then are ACEOs I made using some of my original characters. They are subjects I love so these tend to come out quite naturally. I found photo references for most of my characters by searching up the face shapes I could ‘see’ in my head and then used those as a base to draw from. Since I created head-shot portraits for my characters I can always look back at those when I want to make a new piece of art based on any one of them. Of course I have my favourites and there are some that work better in visual format than others. 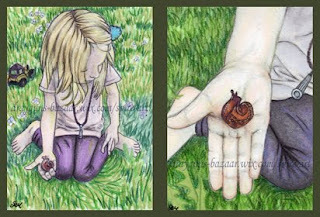 On top of all of that another person was very endeared in my little drawings of Liv and her slug. That person was a local author and publisher named Darcy Nybo. Darcy decide that she liked the drawings so much that Liv should be her character named Emma Jean for a short story she had in mind. In 2015 we worked together to create the short story, ‘Emma Jean Finds a Friend.’ Although I guess I should save that for the 2015 post. Well I hope you enjoyed this rather long entry and look forward to telling all about the short stories Darcy and I worked on in 2015 that made a young girl in Sweden a star without knowing it!